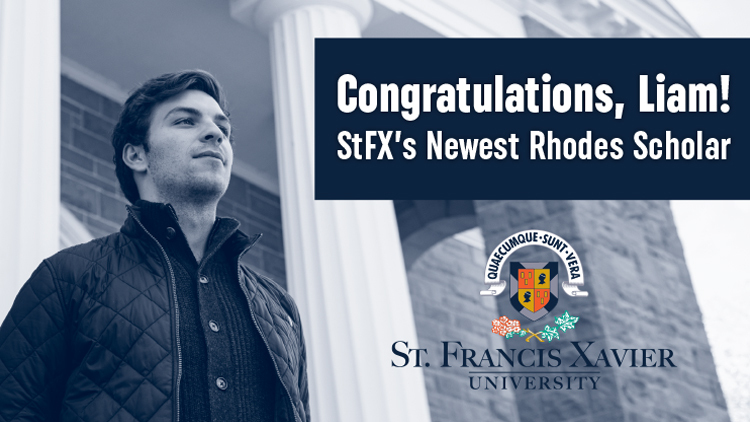 Liam Elbourne, a Schwartz School of Business student from Halifax, NS taking joint honours in business and economics, is StFX’s newest Rhodes Scholar. The scholarship is widely considered one of the world’s most prestigious awards, valued at over $100,000 and enabling recipients to study at the University of Oxford in England. Only 11 students from across Canada are annually selected to receive the award. Mr. Elbourne, who graduates from StFX this spring, has enjoyed a distinguished university career. Most recently, he garnered international attention for his research. In June, he presented his paper “Shocks to Military Support and Subsequent Assassinations in Ancient Rome,” co-authored with former StFX economics professor Cornelius Christian, at the 52nd annual conference of the Canadian Economics Association at McGill University. He was the only active undergraduate student to present in a regular session at this conference, which featured almost 1,000 presenters. The paper was subsequently published in the international peer-reviewed journal Economics Letters, a highly-respected outlet that has published the work of many past Nobel Prize recipients. Full-length stories about this research appeared in some of the world’s leading outlets, including The Smithsonian magazine, The Economist and The Telegraph. Mr. Elbourne is also captain of the X-Men soccer team, and volunteers extensively within the StFX and Antigonish communities. “In my first year at StFX, I never imagined that I would be selected as a Rhodes Scholar,” Mr. Elbourne says. “My main focus was soccer and I didn’t really know what it meant to be a good student or to make an impact in the community. StFX turned out to be the perfect place for me, and for that reason I feel extremely grateful. Mr. Elbourne was the top ranked business student at StFX in the 2017-18 academic year with a 94.25 per cent average. Receiving annual in-house scholarships, he was a finalist last year for the Frank H. Sobey Award for Excellence in Business Studies. He received the StFX Athletic Director's Award for academic achievement in 2016-17 and is a four-time U SPORTS academic all-Canadian. He has twice been a teaching assistant in the Department of Economics and has offered tutoring in courses across the business, economics, and mathematics departments. Now vice president of the StFX Economics Society, he aims to help build a mentorship program to be launched within the StFX Economics Department, connecting current students with StFX’s highly successful economics graduates. Along with excelling in the classroom, he is an active StFX student leader. The AUS Student-Athlete Community Service Award recipient this past fall, he was also the 2018 StFX Male Community X-cellence award winner and was honoured as a Leader of Distinction with the StFX Leadership Academy. In addition, he has led the opening of two year-long Exhibitions of Indigenous Art at StFX. The first was created in honour of the permanent installation of the Mi'kmaq flag on the StFX campus in October 2017, and its success was such that a second exhibition was encouraged by the university. In his three years as president of the StFX German Society, he has been able to contribute positively to the student experience outside of the classroom. He has also been engaged with youth in his community. He has volunteered his time at the grassroots soccer level since he was a teenager, and in 2017, he was a facilitator at a youth leadership conference called Spark the Change, organized by the Healthy Relationships for Youth program in Nova Scotia. A midfielder on the soccer team, he has captained the X-Men for the past three seasons and was a key piece in leading StFX to consecutive second place finishes in the league standings. He is also a former AUS all-star and was the 2014 AUS rookie of the year.